It's that time of the year again when teams start dreaming about lifting the Irish Cup in May. The draw for the fifth round of the Irish Cup takes place at the National Stadium tomorrow with the minnows hoping to land one of the big boys for a glamour tie at the start of January. First contested in 1881, the Irish Cup is the fourth oldest national cup competition in the world. 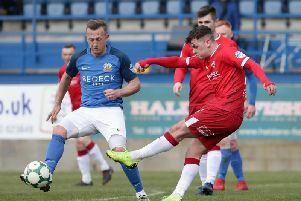 Current holders Coleraine defeated Cliftonville 3-1 thanks to goals from Darren McCauley, Aaron Burns and Eoin Bradley to lift the trophy for the sixth time. Linfield are the most successful team in the history of the competition, having won it 43 times and finishing runners-up on a further 21 occasions. 129 clubs entered the 2017/18 edition of the tournament, sponsored by Tennent's. We will have live coverage of the draw from 12 noon tomorrow, Thursday.